This week has been off to a great start and the theme is clearly that of great doctoral student research! Yesterday morning, we heard that our paper, Supply Chain Network Competition in Price and Quality with Multiple Manufacturers and Freight Service Providers, Anna Nagurney, Sara Saberi, Shivani Shukla, and Jonas Floden, was published in the journal, Transportation Research E 77: (2015) pp 248-267. Both Sara Saberi and Shivani Shukla are two of my doctoral students in Management Science at the Isenberg School. And, coincidentally, or, propitiously, Sara was discussing this very same paper in our doctoral seminar that afternoon so the work was really hot off the press! The publication of this paper is quite exciting, since it is Shivani's first refereed journal article as a doctoral student, and our collaborator is Professor Jonas Floden of the School of Business, Economics and Law at the University of Gothenburg in beautiful Sweden. Professor Floden has become a wonderful collaborator of our supernetwork team since I am also a Visiting Professor there and the Swedes are excellent in transportation, including freight transportation, in both research and practice! I am very pleased to let you know that the committee decided that you are the winner of the first NECTAR PhD Award with your thesis “Essays on operational freight transport efficiency and sustainability”. You have written an excellent thesis, of an original nature and you have published various parts in high-quality journals. Congratulations! Information on the NECTAR PhD award, which Niklas will be the first recipient of, can be found here. He will receive the prize at the NECTAR conference at the University of Michigan in mid June. Plus, just recently, my doctoral student, Dong "Michelle" Li, had her co-authored paper, A Supply Chain Network Game Theory Model with Product Differentiation, Outsourcing of Production and Distribution, and Quality and Price Competition, Anna Nagurney and Dong Li, appear in the Annals of Operations Research 228(1), (2015) pp 479-503. Michelle will be defending her doctoral dissertation proposal in early May and Sara Saberi will be defending her dissertation proposal in April. So, I am a very proud academic Mom. and to make this even a more perfect week, on Friday, the great UMass Amherst INFORMS Student Chapter and I are hosting an event on the Academic Job Process. Coming back to campus will be Dr. Amir H. Masoumi, who was my doctoral student and is now an Assistant Professor at Manhattan College in NYC, and Dr. Davit Khachatryan, who took several courses from me, and is now an Assistant Professor at Babson (after several years in consulting for PriceWaterhouseCoopers). Dr. Masoumi did an outstanding (alright, I am a bit biased) dissertation on perishable product supply chains in healthcare, and, together, with two other co-authors, including my great former doctoral student, Dr. Min Yu, now of the University of Portland, we wrote the book, "Networks Against Time: Supply Chain Analytics for Perishable Products." I heard today the wonderful news that one of my UMass Amherst colleagues, Professor Sandra Petersen, is one of the fourteen recipients of the Presidential Award for Excellence in Science, Mathematics and Engineering Mentoring (PAESMEM), which was announced by President Obama at the White House. A few years back I had served on the committee making the selections. Congratulations to the PAESMEM recipients for your outstanding work in mentorship in STEM! I still have the message from Dr. Pearson, which said: "Our panelists were all great and we had lively and constructive comments and questions from the audience. We were happy to host Mass-AWIS and some K-12 teachers, community college faculty, and 5-College colleagues. Thank you to TWIST, Research Liaison & Development, the Center for Virtual Supernetworks and the student chapter of INFORMS, as well as the NEAGEP Interns for their sponsorship and help. It is encouraging that several groups are working toward raising awareness of issues of “inequalities” and taking steps to resolve them." Bringing expert speakers to share their practical know-how and experiences is fabulous for students' education! Today we had the honor and privilege of hosting Mr. Jeff Meyer, CEO of Blood Services for the Red Cross for MA and CT, in my Humanitarian Logistics and Healthcare class at the Isenberg School of Management. He was fabulous. First some background: Jeff received his undergrad degree at Babson and his MBA from UCLA's Anderson School of Management, where he focused on (bravo) operations management. How can you not love a speaker who comes in and starts talking about linear programming models and how in many of the team projects at UCLA students wanted to work on Red Cross projects because of the challenging problems. Mr. Meyer drove almost 2 hours from Dedham to speak to my class and we kept him overtime for about 40 minutes because his knowledge of blood supply chains is vast. He has worked for the Red Cross for 16 years and, would you believe, he was a consultant for the Red Cross and was offered a job with this organization the day before 9/11. He accepted the job since after the terrorist attacks (and he was in DC and could not get back home for a week) since he decided he wanted to help humanity. He had worked in California for Red Cross blood services and was responsible for managing the construction of a $41 million facility for blood services in southern CA. Mr. Meyer had the class (and me) on the edges of our seats informing us of how the demand for blood in the U.S. has declined since 2008. He spoke of negative drivers and positive drivers and the consolidation of blood centers. The Red Cross now supplies about 40% of the blood in the US and has closed 3 of its 5 testing centers. He spoke about that there are "wet" surgeons and "dry" surgeons, with the former liking more transfusions whereas the latter utilizing fewer in their surgeries. He stated that in studies, more transfusions do not yield better outcomes. He showed us a map of the US marking where there was Red Cross coverage and presence and as Mr. Lou Wigdor, our Isenberg School writer and editor noted, the white parts corresponded to the oil states! I was very impressed that he multiple times spoke about the importance of network optimization, since this is what we have been learning in the class for the past 2 weeks. He also emphasized how efficiencies can be gained from having a bigger collection site (fewer vehicles needed and there is greater potential for good service and more spread out and comfortable service as donors arrive). He noted that, although some perceive blood as being a commodity, it is not and there are many differentiated "products" that it provides. The challenges of this supply chain are immense because of the perishability - with red blood cells having a shelf life of 42 days and platelets only 5 days. Platelets are needed to treat cancer patients and the demand for platelets is growing because of the aging population. From 2008 and prior there were many cases of blood shortages in the U.S. but the scenario has changed due, for example, to the recession and fewer elective surgeries, more individual blood banking, and medical advances that result in less loss of blood. He even described a Red Cross blood app which has been very successful - 80% of those who elect to give blood through the app show up for appointments whereas among those who call for an appointment only 50% do. Clearly, there are also challenges with supply meeting demand and risk associated with donors not showing up. Interestingly, he also shared with us that different hospitals may have different preferences even as to the kinds of testing that is done on the blood which can cost $200 per pint. Out of $3billion in annual costs of the Red Cross, $2billion of that is for blood services. 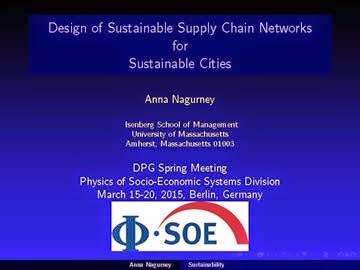 Anna Nagurney and Amir H. Masoumi, in Sustainable Supply Chains: Models, Methods and Public Policy Implications, T. Boone, V. Jayaraman, and R. Ganeshan, Editors, Springer, London, England (2012) pp 49-72. Mr. Jeff Meyer brought out so many interesting research questions today in his brilliant lecture that we will be kept very busy. I'd like to thank him for sharing with the class such illuminating insights about this life-saving supply chain, for which logistics plays a fundamental role. The shocking news of the Germanwings plane (flight 9525) crash today over France in the Alps on a flight from Barcelona to Dusseldorf with 150 lives lost is resonating far and wide. This airplane disaster feels very close to home to me. Just last Thursday I was flying back from Berlin where I spoke at the DPG scientific conference and had flown there from Boston Logan the Saturday before via British Airways. On the latter flight I was seated next to a prep school (Pingrey) group which was en route to Barcelona. There was also a school group on the Germanwings flight (Germanwings is owned by Lufthansa) that crashed today. On my flight to Boston via Heathrow on British Airways last Thursday we had extra passengers since the Lufthansa pilots were on strike, which I thought strange. And last summer my husband and I flew via Germanwings from Berlin to Catania (after bailing out of an Air Berlin flight due to an 8 hour delay) and also from Thessaloniki to Gothenburg via Dussledorf. I had conferences to speak at in both Sicily and Greece and was spending time as a Visiting Professor at the University of Gothenburg in Sweden. I have been seeing lots of press coverage on Professor Arnie Barnett's research in view of this Gremanwings crash. Professor Barnett of MIT is a colleague from INFORMS and is an aviation security and safety expert. USA Today has an article noting his work entitled: Despite flurry of tragedies, air crashes are rare, We hosted him at the Isenberg School in our UMass Amherst INFORMS Speakers Series a while back. With the black box recovery I hope that the mystery of the cause of this Airbus plane crash is solved. Our hearts go out to all those who lost family members and friends in this plane crash. Spring break is almost over and snow is still gracing the landscape of Amherst, Massachusetts! There are many exciting events and activities that await us once all the students return and classes resume tomorrow. There will be several events organized by the UMass INFORMS Student Chapter with the first upcoming one taking place on April 3, 2015. I am delighted that, under the leadership of the chapter President, Michael Prokle, we will be hosting that day an Academic Career Panel: Application Process and Job Expectations. Coming back to the Isenberg School will be 2 of our alums, Dr. Amir H. Masoumi and Dr. Davit Khachatryan, both of whom received their PhDs in Management Science. Amir was my PhD student and did a great dissertation on perishable product supply chains in healthcare. He is now an Assistant Professor at the School of Business at Manhattan College in NYC. Davit, on the other hand, after receiving his PhD, joined the consulting company PWC in Arlington, Virginia, and did terrific work in analytics for healthcare and financial services clients. He is now an Assitant Professor at Babson College in Wellesley, MA. Also, joining the panel will be the newest faculty member in the Department of Mechanical and Industrial Engineering at UMass Amherst, Dr. Chaitra Gopallapa. I served on the search committee that brought her to campus. She has a PhD in Industrial Engineering from the University of South Florida. She worked on health issues at the Futures Institute in Glastonbuty, CT, before joining the faculty at UMass. Questions are now being prepared to ask the panelists and I am sure that the discussions will be terrific. 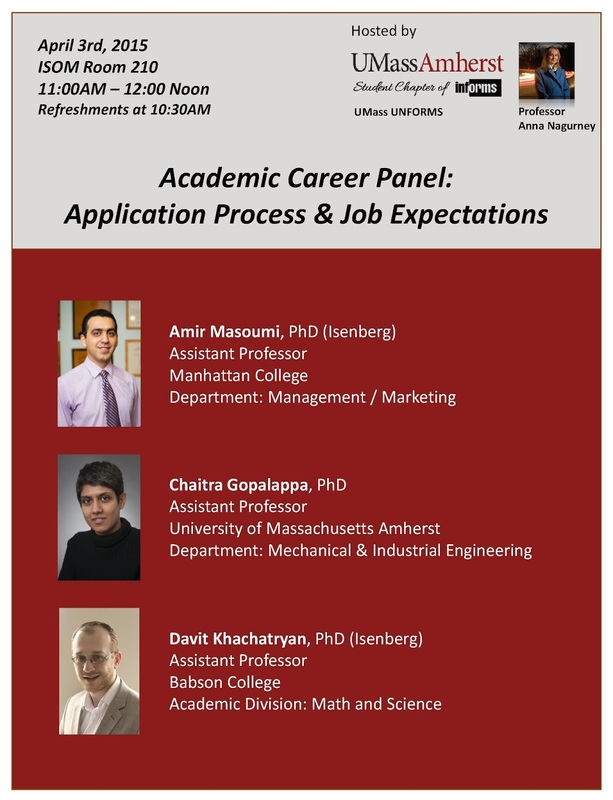 The panel should be especially useful to doctoral students who are interested in exploring academic careers and who may soon be on the job market! I made it back from the DPG Conference in Berlin, Germany late last night via Heathrow to Boston Logan. The flights on British Airways were terrific as was the service and the dinner of chicken curry with chocolate mousse for dessert. I blogged several times about this great conference which had an attendance of 6,000 and I especially enjoyed the sessions organized by the Physics of Socio-Economic Systems group. Below I have posted some photos of the speakers and the ambience as well as some sights nearby that I thoroughly enjoyed. I'd like to thank the organizers for inviting me to speak - I have a fabulous time professionally, culturally, and socially - hard to top. Auf wieder sehen und danke schon! I gave an overview of some of the applications of supply chains that we have investigated from electric power ones to food supply chains and then focused on the work described in a paper just published, with the same title as my talk, in Environment & Planning B 42(1): (2015) pp 40-57. I have enjoyed my interactions with the physicists from Dirk Helbing to Luis Bettencourt and it was great to see Duncan Watts, as well, although he and I are not physicists. I did mention at my talk this morning that I am married to a PhD in physics so I am part of the family! I was hoping to see Angela Merkel here since she has a PhD in physics but I suspect that she was preoccupied with other matters. I would like to thank the organizers for a terrific conference - a perfect way in which to spend my spring break. I am attending a huge physics conference - about 6,000 participants in Berlin, Germany and am here since I was invited by Professor Scholl who organized this conference. Professor Scholl heard me speak at a workshop on Energy and Complex Networks last summer in Erice, Sicily and extended the kind invitation. I have enjoyed the talks very much since there are quite a few talks on network problems. Today was the first full day of presentations and it began with an excellent presentation by Dr. Dirk Helbing from ETH Zurich. He spoke on A Planetary Nervous System to Understand and Measure Our Society. I had last seen Dirk two Septembers ago at a terrific Risk Management Workshop in Zurich, Switzerland, at which we both spoke. Dirk recorded his presentation this morning and said that it should be posted on Youtube in about 2 weeks. At the end of the day I immensely enjoyed Dr. Duncan Watts' presentation: Computational Social Science: Exciting Progress and Future Challenges. The talks here are very interdsciplinary, which I like very much. For example, Watts of small world fame, is a sociologist, who received his PhD from Cornell, and was at Columbia but is now with Microsoft in NYC. His talk had two parts: the first focused on Twitter and the kind of analyses that he has been doing of rare events - messages that go viral. It was fascinating to learn that about 93% of Twitter posts never get retweeted even once. Those who get retweeted 100 times or more are a small fraction of tweets. He analyzed the network structure of such tweets, which are rare events, and require a huge sample for statistical purposes. He found that some viral tweets have a broadcast structure with the media playing a very important role. He said that if you want your message to spread write an OpEd and get it published in The New York Times. Of course, he noted that Justin Bieber and Katy Perry have 15 million followers so, in effect, that act as broadcasters, very often of images and videos (some of themselves). In the second part of his presentation he spoke on Crisis Mapping, a project that he has worked on with the United Nations and also using Mechanical Turk. This really interested me since I am teaching a course on Humanitarian Logistics and Healthcare. He was conducting research to map tweets during a disaster for the United Nations to get information about the disaster. He compared the information gleaned during a disaster versus using the same data but having individuals working in groups using Mechanical Turk. He found some unexpected results in that the larger the group the answers were not necessarily better. Many of the researchers at this conference are interested in socio-economic phenomena and associated problems. I appreciate the methodologies that are being used and the scope of issues that physicists and the like are tackling. Tomorrow morning I have the pleasure of introducing Dr. Luis Bettencourt of the Santa Fe Institute when he gives his invited talk on cities. I will be speaking Wednesday morning. It has been wonderful spending my spring break at this great conference in stately Berlin! Lately I have been quite fascinated by the modeling challenges of both cybercrime and cybersecurity with my belief that the latter can only be well understood and captured if one has a good handle on the former. I have for quite a few years been researching network vulnerabilities and Patrick Qiang and I even wrote a book on that topic: Fragile Networks: Identifying Vulnerabilities and Synergies in an Uncertain World. So moving into cyberspace vulnerabilities was a natural. In addition, when the opportunity presented itself for funding in this area through the Advanced Cyber Security Center then clearly the timing was also right. In a collaboration between the Isenberg School of Management and the College of Engineering at UMass Amherst, we received 2 grants. As part of the second grant, our team organized a terrific workshop at the Sloan School at MIT (I may be biased but it really was terrific from both idea generation and networking perspectives).. The workshop was on cybersecurity risk analysis for enterprises. One of the benefits of such a workshop is not only the brainstorming that takes place but also that research ideas that gel. The first paper in this area in a stream of papers that I have authored or co-authored was recently published in the INFORMS journal Service Science and it is entitled: A Multiproduct Network Economic Model of Cybercrime in Financial Services, Service Science 7(1): (2015) pp 70-81. INFORMS was kind enough to issue a press release on it: A New Model of Cybercrime Factors in Perishanility of Stolen Data, thanks to our wonderful Communications Director, Barry List. The model focuses on financial service firms and captures the decay in the value of cyberhacked products over time in terms of their prices. Exploring changes in the demand price to evaluate greater or lesser interest in criminal products at demand markets. The release has appeared on EurekAlert!, physorg.com, and also by UMass Amherst. I very much like the writeup by Paul Roberts on this paper that appeared in the Digital Guardian: Sale By Date: Research Finds that Stolen Data is Perishable. As for our research on cybersecurity, there we also focus on the network issues and on the probability of an organization getting hacked and incurring associated damages, based on its investments in cybersecurity and also those of the others in their "network." We have developed a series of more general models with the latest one dealing with nonlinear budge constraints. In our work we care not only about good models but also effective computational procedures as well as insights for policy makers. We are utilizing game theory and variational inequality theory for the model formulations, qualitative analyses, and algorithmic implementations. I was absolutely delighted to hear the announcement yesterday in The New York Times that the former President of Lafayette College (my husband's undergraduate alma mater), Dr. Dan Weiss, who is an art historian, with an MBA from Yale, was selected to be the next President of the Metropolitan Museum of Art in NYC. Dr. Weiss had served as Lafayette's President from 2005 - 2013 and I had the pleasure of meeting him and his wife at the college at a lovely event hosted by them in the Fall of 2012 at Lafayette. It was a pleasure to chat with them. They were so personable and pleasant and the conversations just flowed. The new college arts theater will be named after him and his wife, Sandra. Weiss has been the President of Haverford College, another liberal arts college in Pennsylvania, since 2013, and will be leaving after less than 2 years to become President of the Met, probably the top job for an art historian on our planet, so congratulations are in order! In addition, the NYC Public Library is headed by Dr. Tony Marx, the former President of Amherst College, located in the town that I live in. I last saw Dr. Marx when he gave the commencement speech at the Deerfield Academy graduation on May 27, 2012. Both his son and my daughter graduated Deerfield that day and the ceremonies were truly special and elegant. Dr. Marx was part of the carpool on our block - impressive. And he did the driving when he was President of Amherst College, one of the top liberal arts colleges in the country! Both the Metropolitan Museum of Art and the NYC Public Library, two iconic NYC institutions, are located on 5th Avenue about 40 blocks apart. As Weiss said in The New York Times interview, he began going to the Metropolitan Museum of Art when he was a teenager and fell in love with it and so did I. The same holds for the NYC Public Library where I spent many a winter break from Brown University doing research and writing papers, as an undergraduate. And, speaking of Lafayette, it has been quite the year for not only arts but also sports with the 150th anniversary football game played against Lehigh University at Yankee Stadium (Lafayette won) plus Lafayette's win last night in men's basketball against American University so now they are off to the big dance of the NCAA and garnered the Patriot League Championship. Congratulations! Spring is in the air and the snow is really melting today. Plus, it's great to have extra daylight. Academic life is never boring and sometimes you experience a sense of wonder. In the past 2 weeks I have had some rather amazing "coincidences" that I would like to share with my readers. These have added to some of the magic in what has been a record-breaking cold and snowy winter. About 10 days ago, while teaching my Humanitarian Logistics and Healthcare class, I had the students read a paper by two female co-authors, one of whom I had met. The next morning, I received an invitation from a foreign country to review this junior co-author's promotion and tenure case. Needless to say, I accepted and it will be an easy letter to write. Last Monday, while teaching my Management Science Seminar, in which we have been discussing many different network models and behavioral principles, I was describing spatial price equilibrium models, and talking about two of the notable contributors to this area, Professors Takayama and Judge. I even brought photos to share with students of Professor Takayama since I had met him at an amazing workshop in Mallacootta, Australia, just after my first book, Network Economics: A Variational Inequality Approach, was published (and I had carried a copy for him). The very next day, there was a message in my email from none other than Professor George Judge of UC Berkeley. Part of the message said: Anna, nice surprise when your name popped up on my computer this morning. So nice to know your are now working on dynamic network problems. Professor Judge celebrated his 80th birthday on May 2, 10 years ago and, hence, will be turning 90 this coming May. I had received a handwritten letter from him many years ago which is hanging in my office for inspiration since I respect him and his work so much. His latest book, written when he was about 85 was published by Cambridge University Press - truly inspiring! Of course I told him that just the day before I was not only thinking of him but talking about his earlier work! Also, last Friday, we had the pleasure of hosting Dr. Radhika Kulkarni of SAS, whose brilliant talk I blogged about. I had told her about one of my former students, Emily Covill, who was an Operations and Information Management major at the Isenberg School and is getting her Master's at NCState in Analytics. Radhika serves on the board of the Institute for Analytics there. Lo and behold, today, in my email, I had a message from Emily, saying "Employed!!!!." She received an offer from a top consulting firm in Boston and will begin there on September 1. I had not heard from Emily in several months until today. I was thrilled. 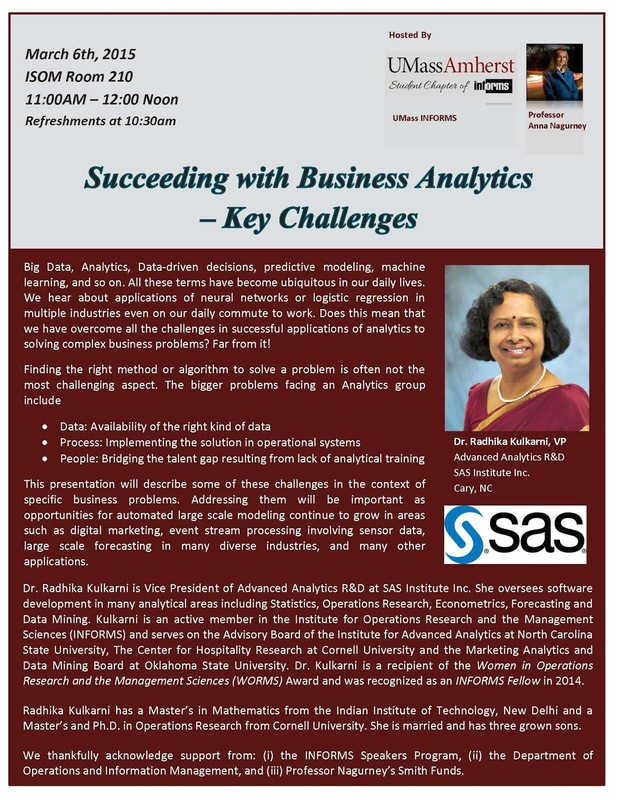 Today we had the great honor and pleasure of hosting Dr. Radhika Kilkarni, the VP of R&D Analytics at SAS in Cary, NC. Kudos to the award-winning UMass Amherst INFORMS Student Chapter for organizing her visit. The students and chapter officers did a great job and I thank them! Special thanks to the Chapter President, Michael Prokle, for all the planning and attention to detail and logistics! Dr. Kulkarni is both an INFORMS Fellow and a WORMS (Women in Operations Research and the Management Sciences) Award recipient and one of the highest technical females in her company, which has 11,000 employees and is consistently ranked as one of the top companies to work for in the US. She began her day in the Isenberg School of Management with a meeting with students in the Elkins Boardroom. The school's atrium was decorated with flags, which was perfect. The conversations and questions and answers were so interesting that the session began at 8:30AM and lasted until almost the reception prior to her talk, at 10:30AM. The free exchange of ideas, ranging from courses that should be offered in analytics curricula, to the training of doctoral students in the hot field of business analytics, to the kinds of projects that Dr. Kulkarni has been involved in from models of churning to ATM cash flow optimization for different banks in different countries, to hotel revenue management and price optimization, were so interesting! She spoke of the integration of different tools and the benefits of harnessing social networks data even in the modeling of fraud. Some of the themes she then further discussed in her presentation: Succeeding with Business Analytics: Key Challenges, that began at 11AM and that was streamed live to our online and part-time MBA students. In her presentation she spoke of the challenges such as Big Data and the Internet of Things. She spoke of the need for speed in terms of algorithms, for example, which is also calling for high performance computer architectures and greater storage. With sensors interacting, there is a need for time series as well as statistical multivariate methods. She emphasized the "mixing and matching" of different techniques, an idea that I very much appreciate. Do you have the right date, the right process, and the right people, she asked?! I also enjoyed hearing her say how important it is to exploit network data and information, including that gained from social media. In the education of analytical experts, cross-disciplinarity is needed and the ability to collaborate. Of course she emphasized the importance of knowledge of statistics, optimization and operations research, as well as mathematical modeling. She ended on a highly enthusiastic note saying how lucky students are who are in this era of analytics. There were great questions and I was delighted to also see some students from my Humanitarian Logistics and Healthcare class in the audience and even one of our OIM alums, Jonathan Farland, who came in from Boston to hear Dr. Kulkarni speak - a disclosure - he works in energy forecasting and uses SAS software. At our lunch at the University Club we had such a great time (although the service was painfully slow and we finally got our lunch around 1:30PM) because the conversations were so much fun. We laughed so much with the stories that we exchanged. Afterwards we had a roundtable in my Supernetworks Lab but there was some anxiety since Dr. Kulkarni's flight out of Bradley was delayed and it looked as though she would miss her second legged flight from Philly to Raleigh later this evening. We bid her farewell, all feeling so energized and intellectually stimulated. Dr. Kulkarni's visit was co-sponsored by the INFORMS Speaker Program and the Operations and Information Management Department, with additional support from my Chaired Professorship Fund, and with help from the MBA Programs Office. Thanks to all involved and with special thanks to Dr. Radhika Kulkarni, an amazing role model and business analytics professional and operations researcher. I have helped students in the UMass Amherst INFORMS Student Chapter to organize the UMass Amherst INFORMS Speaker Series for many semesters. Of course, associated with bringing speakers from out of towm is the uncertainty as to whether they will be able to make it - things happen - illnesses and weather disruptions, to name just two. And, in fact, a program officer from NSF had to cancel her talk since her flight was cancelled from DC today. Not only are the INFORMS offices closed in Maryland, but also USA Today is reporting that 20% of the flights in the US are cancelled today due to inclement weather. Our speaker, Dr. Radhika Kulkarni, just landed a few minutes ago in Bradley Airport, having flown from Raleigh, NC through Pittsburgh to make it to her presentation at the Isenberg School tomorrow, with extra events planned. Needless to say all those involved have breathed a big sigh of relief, including me! Special thanks to the INFORMS Speakers Program, the Department of Operations and Information Management at the Isenberg School, and the MBA Programs office for assisting in the co-sponsorship and organization of this event. Her presentation at 11AM tomorrow will be viedotaped and streamed live to our interested MBA students. The students did a great job designing the poster below and Dr. Kulkarni's talk is advertised both on the UMass Amherst events page and the Isenberg webpage. At 8:30AM tomorrow morning, we will be having a Meet and Greet in the Elkins Boardroom Room 111 in the Isenberg School. Also, and just in time, the Officers of the Student Chapter have updated the student chapter poster on their Isenberg School bulletin board. Many thanks to the Chapter President, Michael Prokle, and the officers. Who would have thought that the role of a professor is also being an events manager? 3 Papers Published in Less than 3 Weeks! This has certainly been a winter of record-breaking cold as well as snowfalls in the Northeast of the US! In the case of Amherst, we had the coldest average temperatures in February since records were first taken back in 1835! You may take some solace through the frigid temperatures and disruptions, the roof problems, ice dams, home water leaks, etc., from a recent study from Harvard University, "Rainmakers: Why bad weather means good productivity." New Englanders tend to be very hardworking and, given the number of academic institutions in our area, we certainly contribute to the education and research missions. I always say that "good news happens in 3s" and in less than 3 weeks I have had 3 papers published in journals, which I think is a record for me. In academia, one may have a paper accepted for publication and then the journal will put it online but it may still take some time to have the paper actually appear in a journal volume. In academia we certainly learn patience and I try to instill that in my doctoral students, sometimes with mixed success. On February 16, 2015, my paper, Design of Sustainable Supply Chains for Sustainable Cities, which was an invited paper for the Complex-City Workshop, December 5-6, 2011, Amsterdam, The Netherlands, was published in Environment & Planning B 42(1): (2015) pp 40-57. It had actually been posted online in January 2013, and then it took over 2 years to appear in a special edited volume of the journal. The timing is, nevertheless, propitious, since, in mid-March, I will be delivering a big lecture at a plenary symposium in Berlin, Germany on the topic. On February, 18, 2015, I had the pleasure of sharing the joy of a publication with one of my doctoral students, Dong "Michelle" Li. Our paper, A Supply Chain Network Game Theory Model with Product Differentiation, Outsourcing of Production and Distribution, and Quality and Price Competition, was published in the Annals of Operations Research 228(1), (2015) pp 479-503. And today, March 4, 2015, the paper, A Multiproduct Network Economic Model of Cybercrime in Financial Services, was published in Service Science 7(1): (2015) pp 70-81. Amazingly, even the temperature now is above freezing in Amherst and some of the snow is starting to melt. This semester I have a Monday Wednesday teaching schedule but my Mondays are true marathons with a morning class on Humanitarian Logistics and Healthcare, which is an hour and a quarter, and an afternoon seminar, on Advances in Variational Inequalities, Networks, and Game Theory, which is 2 hours and 45 minutes. I do a lot of lecturing in the latter class, although it is a seminar, because I want to make sure to bring all the students who come from different programs on campus to more or less the same level of knowledge. So, do the math, the sum is 4 hours, which is exactly how long it takes me to run a marathon, which I have done several times in the past (no matter what my training was). I never, ever sit while lecturing. I love the energy expended on teaching and the energy that I get from my students. Plus, when you have the opportunity to teach subjects that you are passionate about, the time flies (and, yes, many times we go over the time but there is so much to discuss and share). I love face to face teaching and the interactions with students, which I would really miss if all the classes were online plus teaching is fabulous exercise if you do it right! And being a professor is also good for your health. In a study, "Postponed aging in university teachers," Kristjuhan and Taidre write that: In some population groups, human life expectancy is much higher compared to the average in the population, which can provide new hints to postpone aging and prolong life. Studies show that university professors have a later onset of age-related diseases compared with most population groups. Their productivity mostly increases up to their 60s and remains high for many years afterward. Aging processes appear later compared to the average in the population. Studies in Estonia have shown that university professors have 9 years longer life. Operations research and economics have a good number of faculty that I have had the privilege of meeting and some even knowing that worked through their 80s and even part of their 90s (Professors George Dantzig, Kenneth Arrow, Leonid Hurwicz, Bill Cooper, Paul Samuelson, and Martin Beckmann, to start). And unlike after running a marathon, in just a few days, if not hours, faculty are raring to go again!